We've started to see quite a few 300ZXs at LeMons races, in addition to the usual crop of 280Zs and 280ZXs. For reasons we don't understand, the Zs haven't been so reliable at LeMons races; at some point, though, one of them is bound to dominate a race. We're also hearing rumors of a possible 510 at a future West Coast race, and we hope they're true. This mean-looking Datsun finished a strong 36th, with a good best lap of 1:38.217. Yes, the 280ZX is a fast car. Check out the team blog here. It's always good to see a grotesque pig's head on the roof of a car, and 1:37.216 means the Sentra has what it takes… though the 20-lap BS penalty- no doubt for SE-R suspicion- pushed the car down from the high 30s to 48th place. Here it is, the real winner of the 2008 Arse Freeze-A-Palooza! That's right, the Index Of Effluency trophy went to a Datsun Honey Bee, which came with many components from the B210 that rolled so spectacularly at the '07 Arse Freeze. 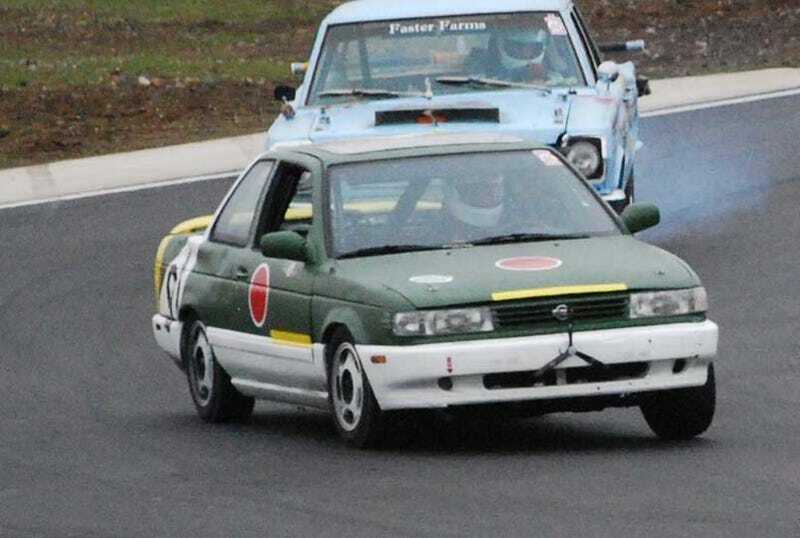 This time, the ol' Datsun kept going around the track… and around… and around, eventually coming in 13th. You wouldn't call it fast- not with a best lap of 1:47.315- but it was persistent, and that's what counts in an endurance race. Of course, the 10 bonus laps awarded during BS Inspection didn't hurt, making the difference between 13th and 21st, but this car had the IOE nailed down just by staying out there the entire time. The 24 Hours Of LeMons Arse Freeze-A-Palooza Index Of Effluency Winner: B210 Racing! Some say- well, fine, everyone says- that the V6 in the 300ZX isn't as good as the inline six in the earlier Zs, but keep in mind that a 300ZX finished 8th at LeMons South '08. This thing looked really redneck, with a Pathfinder intake and Altima throttle body sticking out through a crudely chopped hole in the hood. Project Fate had some difficulties, starting with a 5-lap BS penalty, but they never gave up. 79th place. The kitty-litter-box hood scoop and innovative side skirts really pimped up this fine Datsun machine, but those features didn't provide sufficient reliability to ensure better than 95th place. Another V6 Nissan, more mechanical problems. 63rd place still gives the UNDERGROUND team bragging rights, though- this race is tough! We are getting a little tired of the warplane themes on LeMons cars, but this one is pretty well executed. At 34th place and a best lap of 1:39.872, this team provides more evidence that the Sentra is a solid LeMons vehicle choice. You couldn't miss the bright freakin' yellow 280ZX out there on the track, and this team scored an impressive 22nd-place lap ranking. Good to see a Z stay together for nearly all of a race! You can get nice shiny 300ZXs for peanuts these days, and this one looked good out there. 41st place.